You would be amazed by how many times a Malaysian would eat a day, especially those Penangites with so many options available from breakfast right up to supper. You have so many choices at each and every corner of every district such as Adam’s Karipap Ayam (chicken curry puff – RM1.50 each) in Pulau Tikus Market along Jalan Pasar, Te Chang You Tiao Wang (the longest Chinese cruller at 14” length – RM1 each) along Jalan Paya Terubong, 8o varieties of kuih-muih (local finger snacks – 40sen each) at Mat Relax Corner along Jalan Jones or even some authentic Cantonese snacks at Guangzhou Cake House along Lebuh Carnarvon. Who could resist such temptation even at odd hours of the day? 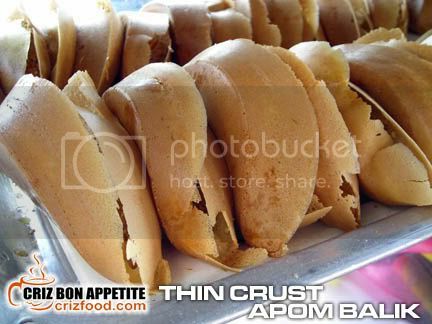 Another great snack would be the Malaysian Pancake, commonly known as Apom Balik by the Malays and Ban Chang Koay by the Chinese community. Where could you get such great snack then? One prominent place would be right in town itself. With a continuous flow of buyers from all races, En. Noor Azam has been selling his Apom Balik right in front of the General Post Office (Pos Besar Pulau Pinang) along Downing Street (Lebuh Downing) for more than a decade. 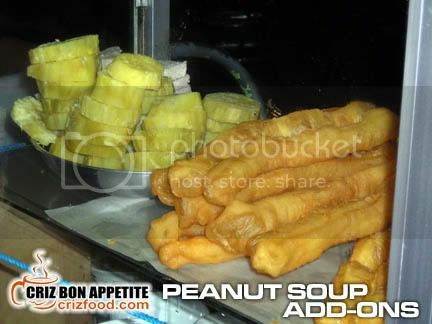 What made his Apom Balik (60sen each) so demanding compare to many other sellers in town? 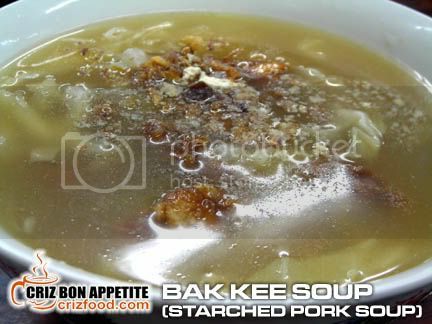 His Apom Balik has the right texture, thickness, sweetness, buttery taste, freshness of the pounded peanuts and most importantly the crunchiness on the crust at all time. There are actually two types available at his roadside stall. One would be a thinner version with crunchy crust. You could opt for plain or with cream corns. Another version would be the thicker type being slowly cooked in a large pan. This version would be more fluffy and soft in the center. 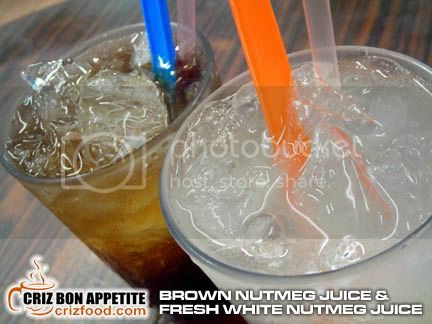 If you are at that area, do try his Apom Balik out. I had not stopped patronizing his stall each time I’m around that area as I find his skills in preparing this wonderful snack had maintained its consistency throughout all the years. It’s a great snack for tea. Finding the stall would not be hard if you frequent Lebuh Pantai (Beach Street) often for your banking transactions as this is the road where all the major banks are located. Just drive along Lebuh Pantai until you have reached Hongkong Bank. 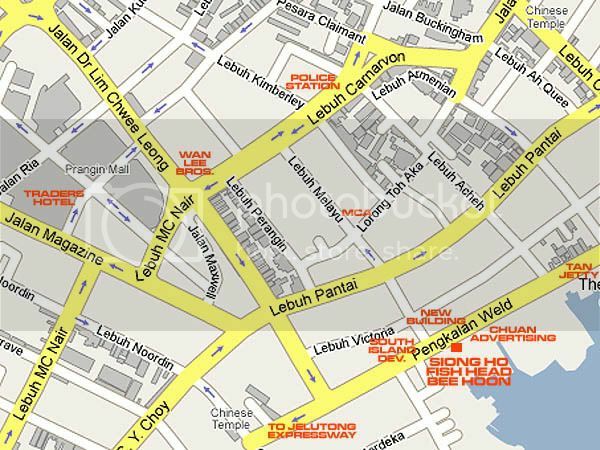 The road next to the bank is Lebuh Downing. Drive right until the end and you would see the General Post Office at the junction of Lebuh Downing and Pengkalan Weld (Weld Quay). 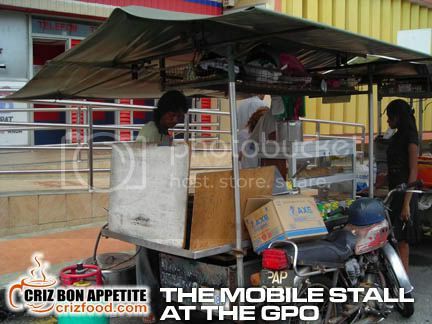 The stall is just in front of the GPO, next to a Chinese iced drink seller. Do try out the corn drink here too as it’s one of the good ones around. Address: Lebuh Downing, 10300 Penang, Malaysia. 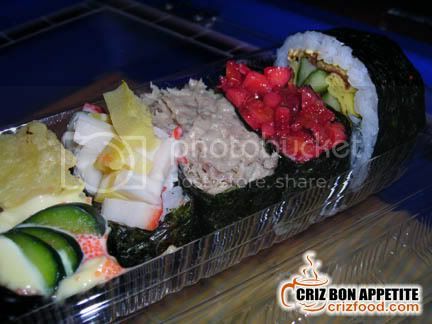 Note: Please refer to http://www.crizfood.com/1019/siongho/ for the update on the relocation of the stall effective 18 March 2010. 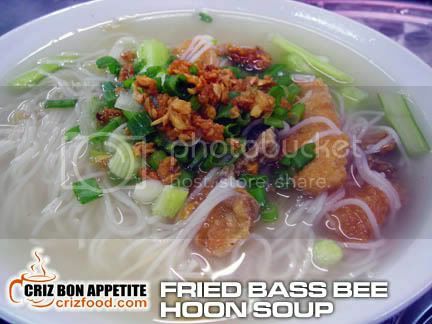 If you are thinking of having some fresh seafood noodles or porridge (especially during this humid and contagious flu and fever season), you can always head over to the newly open branch of Siong Ho Fish Head Bee Hoon (Sg. Tiram, next to Shell petrol kiosk Bayan Lepas) along Weld Quay, Georgetown, Penang. 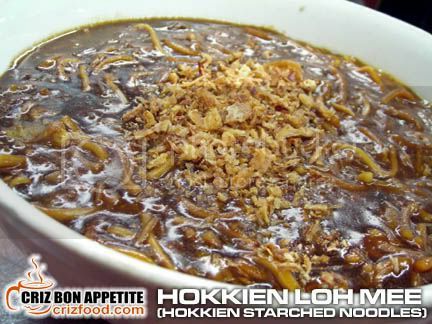 The owner, Mr. Teh (Ah Ho) had more than 20 years of experience in cooking up fresh seafood noodles and porridge just for you. 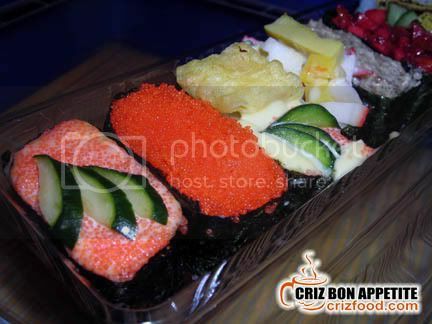 If the ingredients were not fresh as it should, they will definitely not pass the regular QC check of the boss. 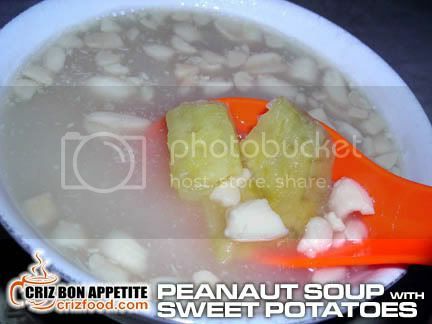 There are two types of soup you can choose from on top of the different arrays of seafood and meat. 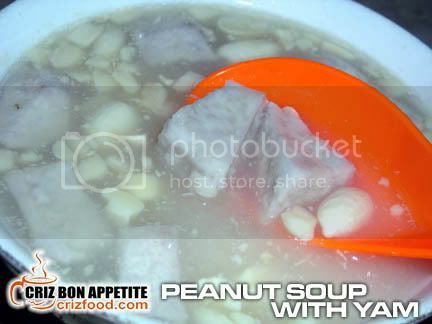 One would be the clear soup broth which was boiled with lots of chicken bones, dried shrimps with their secret recipe. 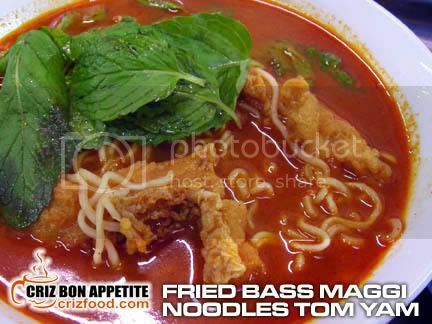 The other would be a spicier choice with tom yam paste. Firstly, you have 5 options for your bowl of hot steaming meal. You can either choose thin rice vermicelli (bee hoon), thick rice vermicelli (cho bee hoon), wheat flour vermicelli (mee sua), instant noodles (maggi mee) or porridge (moey). The next step would be choosing your main ingredients such as large white prawns, grouper fish head, grouper fillet, fried bass fillet, minced meat, frog, pork kidney, meat balls, fish ball and dried bean curd. More ingredients such as crabs, squids and so on would be available at a later date. 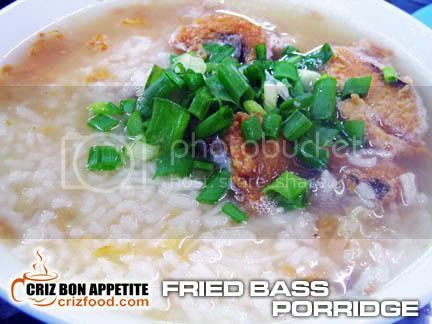 One of the most sought after dish would be the fresh Frog Porridge (RM6/100gms). 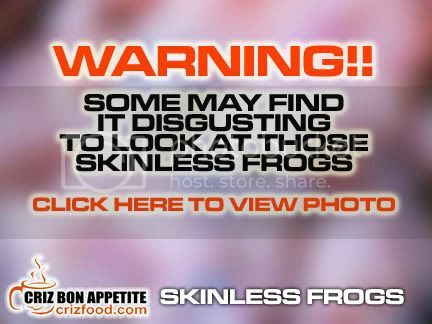 One look at the color of the skinless frogs, you will know that they are real fresh. Those frogs may look rather gross to some but their flesh can be as smooth and tender as chicken meat. That’s how the frogs got the name “Water Chicken” as in “水雞” in Chinese. Here’s an inside peep at what are the other ingredients that they would use make each bowl of the dish delicious. The best part is that the meals served here are MSG free, thus you won’t feel thirsty after consuming. Since this is a “pick & choose” what you like concept, the pricing might be different for each individual bowl of order. Basically, a bowl of minced pork related noodles/porridge would cost you as low as RM3.50 to “God knows how much you love seafood” type of order which would cost you tens of dollars. Just to be on a safe side for those budget food hunters, let me share some of the basic pricing with you. Majority of patrons over there would order fried bass fillet meals. 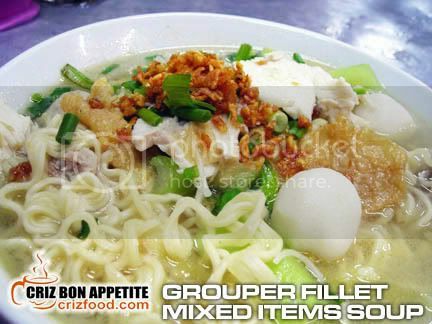 All types of noodles or porridge with only fried fish fillets with vegetables would cost you RM5 per bowl. I managed to try out both the clear soup as well as the tom yam noodles. Let me share with you my experience on each bowl of the noodles. 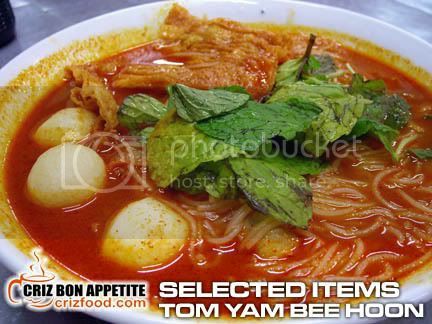 Firstly, it was the Tom Yam Bee Hoon without any fresh seafood. 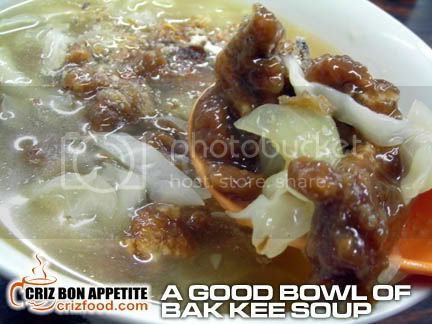 My bowl consisted of only fish balls, meat balls and dried bean curd together with bee hoon. It was priced at RM5. The color was fiery red but it was not chili hot at all for me. The soup was thick, sweet and tasty with the fragrance coming from the added Kaffir lime leaves and mint leaves but somehow it lacked some vegetables such as tomatoes, young corns or abalone mushrooms. I had suggested these additional items to the boss and hopefully he would have them during my next visit. The next was my “pick & mix” items for my instant noodles with clear soup. I had picked fish balls, meat balls, dried bean curd with fresh grouper fillets. Although the bowl cost me RM10.50, it was worth the amount spent considering that there were a generous amount of grouper fillets inside the bowl. The taste of the soup was amazing. It has the sweetness from the fresh fish fillets with a hint of preserved vegetables (Dong Cai/冬菜 – salted dried cabbage with leeks and sea salt water). On top of the added ingredients, this bowl of noodles was rather fulfilling. If you are coming from Prangin Mall along Jalan Dr. Lim Chwee Leong, drive straight pass the Lebuh Carnarvon traffic light. You will reach another traffic light (Lebuh Pantai). Drive straight again until you have reached the Weld Quay (Pengkalan Weld) traffic light. 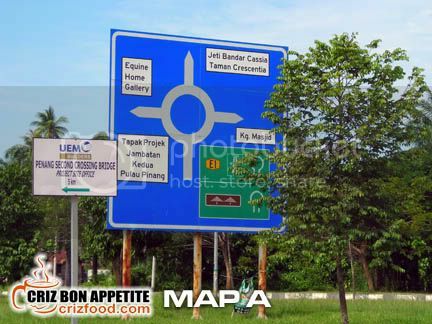 Turn left and drive on until you have reached the first left junction (Lebuh Melayu). The shop is just diagonally opposite the newly constructed building in brown color. If you are coming from the ferry terminal, keep a watchful eye on the landmarks on your left, especially those Jetty signboards. 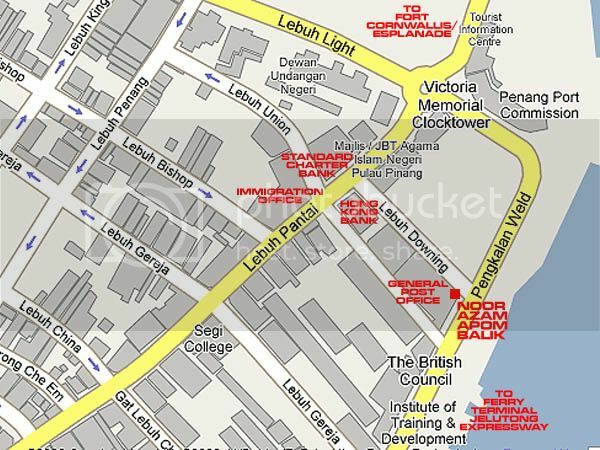 You would pass by Lim Jetty (temple), Chew Jetty (hawker area), Tan Jetty (Xen Teck Café), Lee Jetty and Mixed Surname Jetty. Immediately after the Mixed Surname Jetty, slow down your car. The shop is just after signboard maker, Chuan Advertising and next to Chun Heng Auto Repair. You won’t miss it as the boss and his workers are all dressed in chef uniforms and cute Bermudas. 😛 You may find parking a bit hard along the heavy trafficked road as it’s the main road leading to the Jelutong Expressway/Penang Bridge. Try driving a bit further up to Yeoh Jetty. You should be able to see some open space there. If not, you have to drive a bit further up to Lebuhraya Merdeka where Ghee Seng Seafood Restaurant is located. 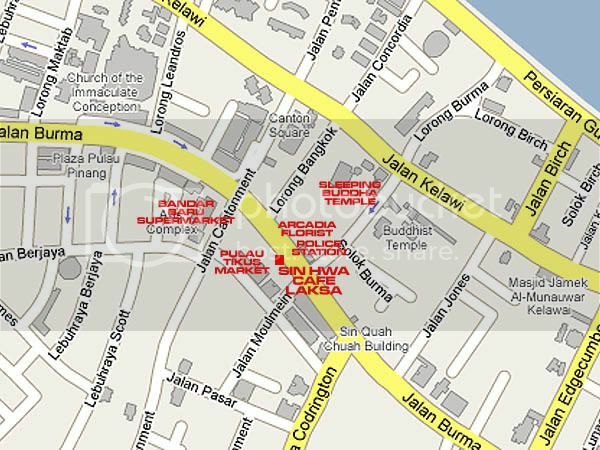 Address: 107-A, Pengkalan Weld (Weld Quay), 10300 Penang, Malaysia. If you want to know the success story of a Char Koay Teow stall, you should check out the stall located at a corner shop lot named Kedai Makan Teong Ah along Lebuh Cecil (Cecil Street). I had to wake up real early this morning at 5.00am just to make an effort to visit the place and have a chat with the cook, Mr. Leow, who has started frying Char Koay Teow as early as 1967. For the past 40 years, Mr. Leow has been frying along the roadside of Magazine Road before he was forced to move out due to a road expansion project. Currently, he has shifted to this new premise for more than a year. 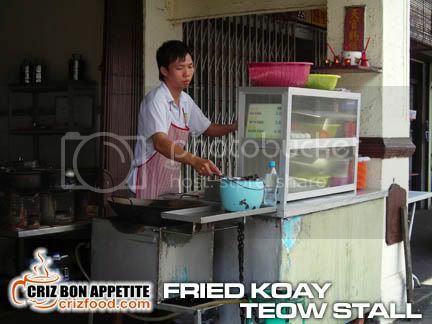 Why is Mr, Leow’s Char Koay Teow so unique and famous that he has to open up for business so early in the morning? It’s very obvious as his Char Koay Teow and Fried Rice has been the hot favorite of many factory workers. By the time I was there at 5.40am, he had already packed more than 50 packets of Char Koay Teow and fried over 20 plates. What is so different in his style compared to some of the famous ones around? He uses almost the same ingredients as the others but there’s one hidden secret. He uses charcoal and his high heat frying skills that I could hardly take a proper shot from his hyper motions. 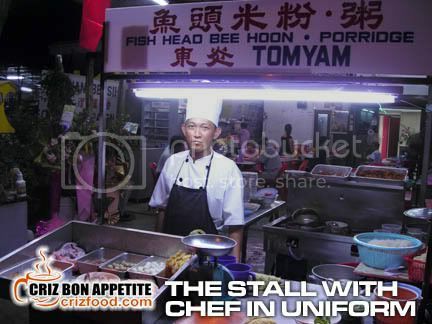 Another reason is that his Char Koay Teow is believed to be the cheapest within the whole of Penang Island. A plate of Char Koay Teow with an egg, three large prawns, cockles and some sliced Chinese sausage fried with some lard, bean sprouts and chopped chives cost only RM2.60. I had mine added with extra fresh prawns and it was only RM3.30. You can also opt for the Char Koay Teow fried with duck egg. It’s only RM3. The Char Koay Teow was not oily at all and it had a banana leaf laid on the plate prior to serving. Somehow, not many Char Koay Teow stalls are applying this method nowadays although this would give that additional aroma to the noodles. On top of that, the dish had the right saltiness, spiciness and a bit of burn flavor in it. Since the Char Koay Teow was so delicious, I was tempted to try out the Fried Rice as well even though it was a bit too heavy for such an early breakfast. The price was the same as the Char Koay Teow but instead of the ingredients stated above, he used only rice, chopped char siew (bbq pork) and fresh prawns. The Fried Rice was indeed another good experience. The dish had that unique burn flavor again with a well combined taste to my liking. Every single grain of the rice was well coated with rich flavor. This is also a must to try out. If you would like to have many packets of takeaways, I would advise you to call him up prior to collecting. From my observation during the one hour of patronizing his Char Koay Teow stall, his handphone was like a hotline. Searching for the Char Koay Teow stall would not be hard at all as it’s just right at the junction of the Cecil Street evening wet market (七條路巴刹). 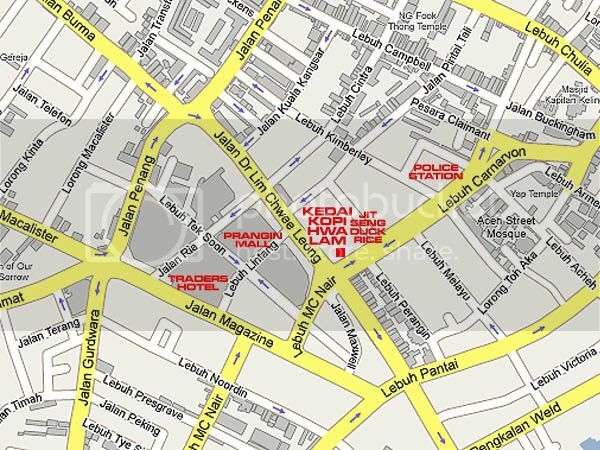 If you are coming from Jalan C.Y. 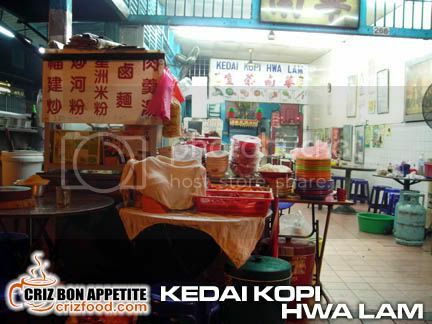 Choy, it’s just right at the corner with a large signboard “Kedai Makan Teong Ah – 中亞茶室) as you turn right into Lebuh Cecil. 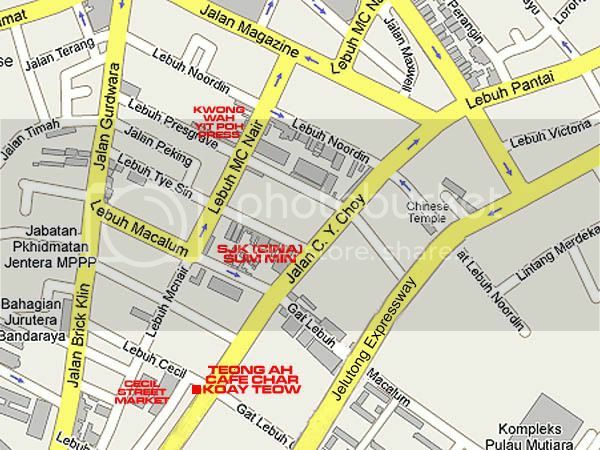 Address: 246 Lebuh Cecil, 10300 Penang, Malaysia. Laksa is another one of the great hawker dishes one should not miss if you were to be in Penang for a visit. Originated from the Peranakan (Baba and Nyonya) culture, this dish will come in two different flavors, namely assam (tamarind) soup base or lemak (in coconut milk) soup base. The fish used for this delicious delicacy may differ for each store as some may use ikan parang (wolf herring), belut (eel), ikan kembong (Indian mackerel) or ikan selar (yellow tail scad). Most commercially used would be the latter two as the wolf herring contained too many tiny bones to work with and eel would be rather expensive. The most common Laksa you will get easily throughout the state of Penang, either in Chinese, Malay or Indian styles, would be the Assam Laksa. 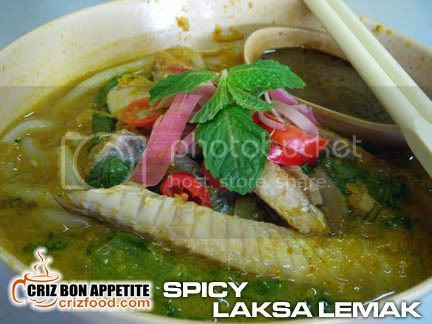 The other not so commonly found would be the Laksa Lemak, a spicy version of fish soup base with the use of coconut milk. 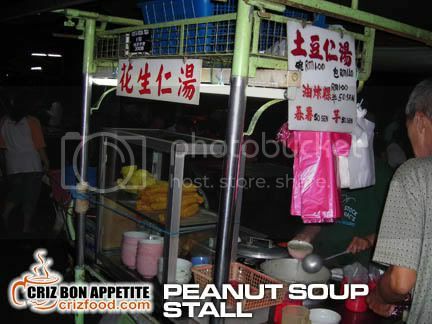 I found a few such stalls selling in Penang but I personally love the one served in Sin Hwa Café where the reputable Char Koay Teow stall is. What matters most in a Laksa dish is not the ingredients served but lies within the tastiness of the soup broth and the quality of the prawn paste used (heko). In a typical bowl of Laksa, you would get the laksa noodles, sliced cucumber, lettuce, onions, pineapple and mint leaves, garnished with sliced ginger flower buds (bunga kantan) and red chillies, topped with some diluted prawn paste (heko). Sin Hwa Café Assam Laksa is somewhat different as in taste as the cook would use tamarind juice instead of tamarind peels as some of the other stalls. It has just the right amount of sourness to my liking. Some ladies may want the soup to be a bit more sour in taste but as a guy here, I like it just the way it is with many spoonful of the yummy prawn paste. A normal bowl would cost RM3 whereas a larger bowl would be at RM4. The other version I had tried was the Laksa Lemak. On top of the typical serving of ingredients, it has that special spicy and milky taste that I like very much. The soup broth had the pungent taste of lemongrass, a hint of fresh turmeric and not too overpowering taste of coconut milk. 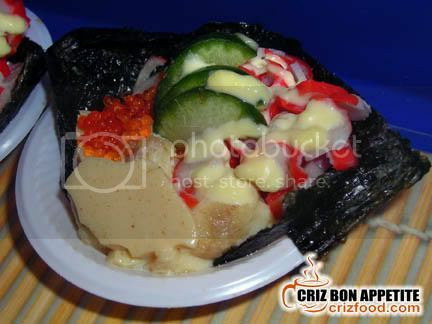 This would be perfect for those who prefer a spicier dish and prawn paste lovers. The price would be the same as the Assam Laksa. You would be surprised if I were to tell you that the above two were not my most favorable choices, it’s the third choice – Laksa Assam Lemak. Yes, it’s a combination of both the soup broths. 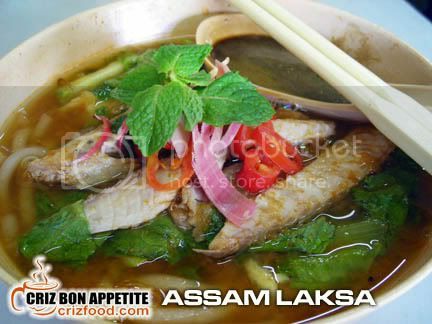 The best combination would be 2/3 of the Lemak soup and 1/3 of the Assam soup. You have to inform the seller on your preference as he would always combine half of each soup broth. Please also take note that the Penang Assam Laksa and Laksa Lemak are totally different from those served in other states such as the Laksa Perlis, Laksa Kedah, Laksa Ipoh, Laksa Kuala Kangsar, Laksa Johor, Laksa Sarawak, Laksa Kelantan or even the Laksa Katong as some of these are actually a variant of Penang Curry Mee (a thicker coconut milk soup base). 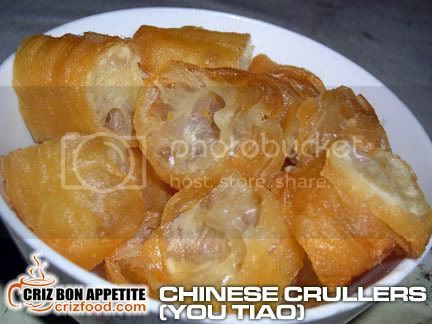 Moreover other ingredients used may include fried tofu puff, fried/hard boiled eggs, chicken meat, prawns, fish cakes, fish balls, char siew, and more. 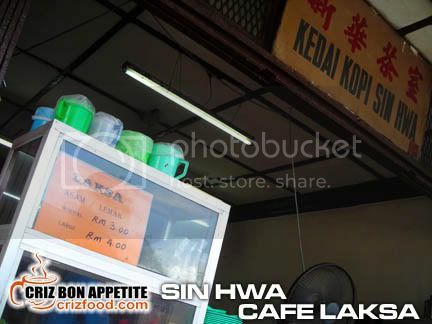 The Laksa stall in also in Sin Hwa Café in Pulau Tikus. If you are coming from town along Jalan Burma, you would a service road after Lebuhraya Codrington on your left. 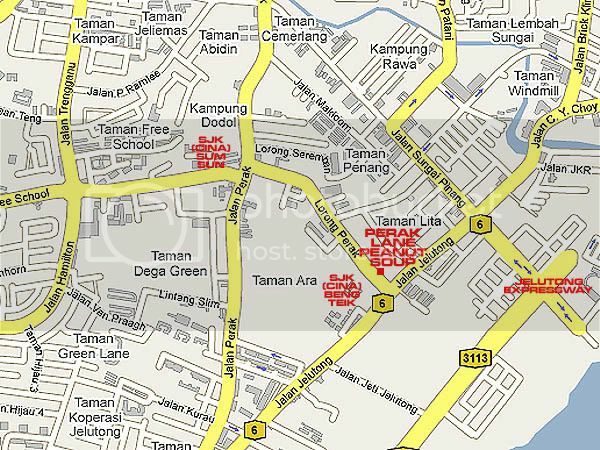 That’s where the Pulau Tikus 7-11 branch is. Try finding a parking space there. If you can’t find one, you will have to come out of the service road into the main road and turn left into Jalan Moulmein (between two coffee shops). Drive further until you have reached a crossroad (Jalan Pasar/ Jalan Moulmein/ Persiaran Cantoment) and you will see a huge car park at a corner just opposite along Persiaran Cantonment. Park your car there and walk back up Jalan Moulmein, turn left and walk further up and you will see the stall within the premise of Sin Hwa Café. 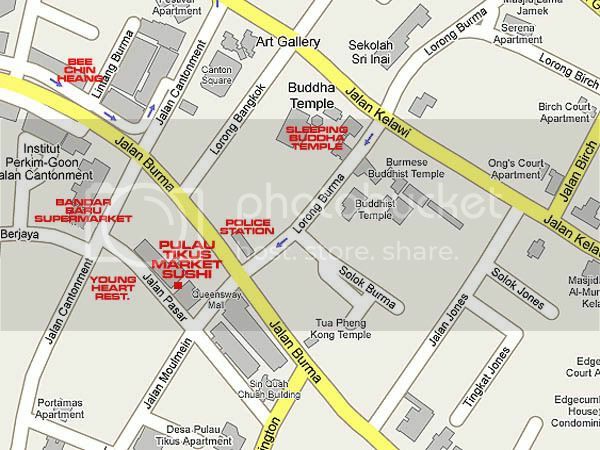 Address: 329 Jalan Burma, 10350 Penang, Malaysia. 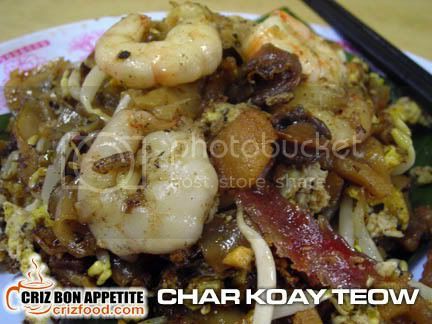 One of the more famous hawker dishes in Penang would be the Char Koay Teow. Everyone, regardless locals or tourists would swarm around these fragrantly fried koay teow (he fen or rice cake strips as some may call the noodles) stalls at any time of the day. In Penang alone, there are many versions of Char Koay Teow. Some would be fried dry whereas some would be cooked in a rather wet method. The ingredients alone differ from stall to stall. 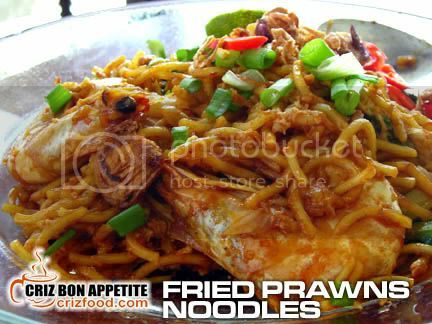 The basic ingredients would be the noodles, shrimp, bean sprouts, chives and cockles fried with special sauce with the option of added chili boh, chicken or duck eggs. 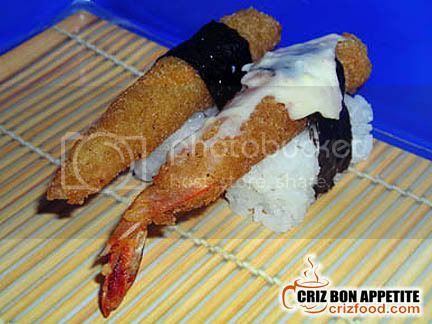 Nowadays, with the competition from so many stalls, you can have other options such as squids, Chinese sausages, fish cakes, mantis prawns or even large king prawns. You would be amazed with what other seafood they would be adding in next. 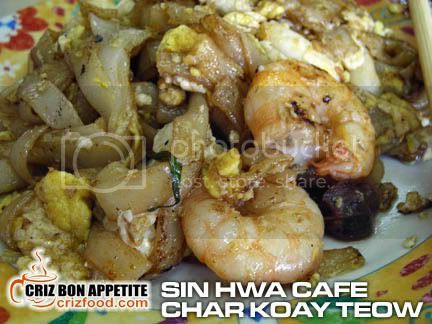 One such famous stall would be the one situated along the heavily traffic area of Pulau Tikus – Sin Hwa Café Char Koay Teow. For a few generations, the household members of this well known stall in Penang has been frying out some good Char Koay Teow ever since they had moved from the Jalan Gottlieb food stalls decades ago. With the main stall still within the premise of Sin Hwa Café in the early evening and another stall located in the Pulau Tikus Market Street Food Corner at night, many people have been patronizing them ever since. A normal plate without egg would cost you RM3, with egg would be RM3.50 and with duck egg at RM4. I visited the main stall recently to check out whether the taste had changed since it is now managed by the 3rd generation. The ingredients still maintained the same with the similar quality of lard oil, taste and spiciness but the style of cooking has differed quite substantially. Here’s what I was served. Due to the cooking style and the amount of heat applied (wok hei) during the frying process by another new generation member (the grandson of the original seller to be precise), I personally felt that the taste was a bit out from what I had tasted before. It was not as dry and fragrant as before. On top of that, the noodles were not loosened up well. Certain parts of the noodles were still stuck together, thus were not evenly flavored. Other than that, everything else was fine. I hope the cook would take note of this minor hiccup so that his client won’t be further disappointed. Sin Hwa Café is located along a heavy trafficked area. To find a parking space would be rather hard. I will show you where would be the best few places to park your car. 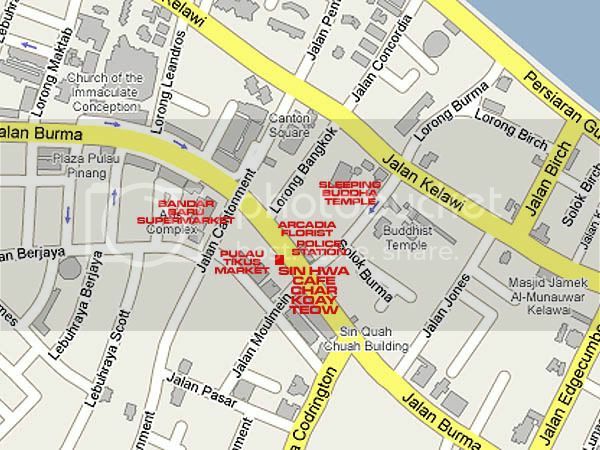 If you are coming from town along Jalan Burma, you would a service road after Lebuhraya Codrington on your left. That’s where the Pulau Tikus 7-11 branch is. Try finding a parking space there. If you can’t find one, you will have to come out of the service road into the main road and turn left into Jalan Moulmein (between two coffee shops). Drive further until you have reached a crossroad (Jalan Pasar/ Jalan Moulmein/ Persiaran Cantoment) and you will see a huge car park at a corner just opposite along Persiaran Cantonment. Park your car there and walk back up Jalan Moulmein, turn left and walk further up and you will see the stall along the five foot way of the old shop houses. You won’t miss it if you have a strong sense to follow the emitted aroma from the Char Koay Teow. When you mention about Uncle Bob’s Taiwan Styled Fried Chicken (RM5), most frequent night market (pasar malam) goers would surely heard about them. 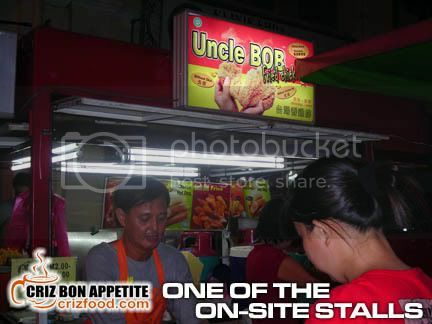 Being the first to bring in this Taiwanese snack concept to Malaysia, Uncle Bob has been operating this business since 2002, spreading its mobile snack vans all over peninsular and east Malaysia. Well, being a successful pioneer in this food industry has always a drawback. More and more competitors have mushroomed all over the country plagiarizing this successful story. In fact, I had noticed that some competitors even offered more flavors than the existing original and spicy recipes Uncle Bob has. What made Uncle Bob so successful in this business? 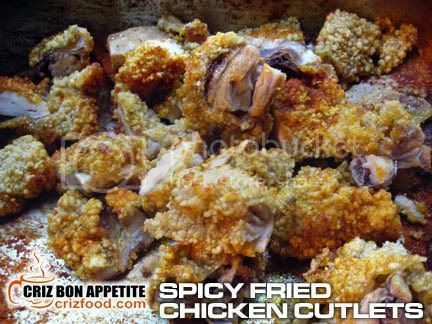 All you can see is just a piece of chicken breast meat or boneless drumstick coated with some bread crumbs, deep fried and sprinkle with some flavoring. That’s nothing special right? 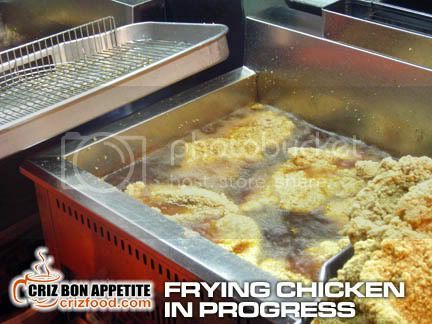 What many did not notice is that those chicken meat pieces have their skins and fat removed prior to the frying process. This is a healthier version? Maybe not but at least the consumption of fat would be lesser than most of the existing fried chicken stalls around. Uncle Bob has just two flavors to their bite sized crunchy chicken cutlets, namely original and spicy. The spicy ones were the most sought after. On top of the smooth selling product stated above, Uncle Bob has its Research & Development (R&D) group based in Taiwan to find out more products that would the local market. 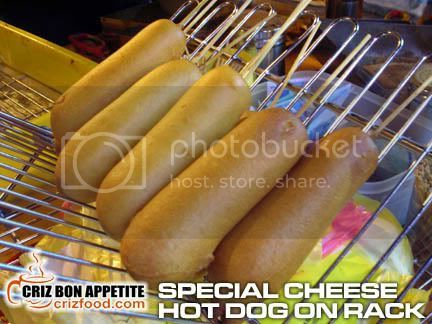 One of the products that launched not long ago was the Sweet Batter Coated Cheese Hot Dog Stick (RM2). 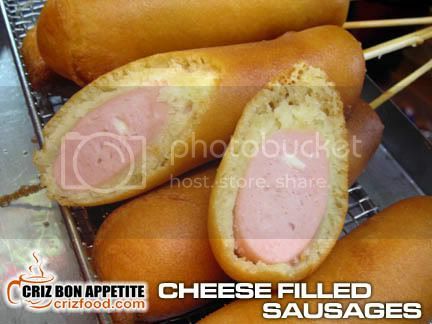 It has a jumbo sized cheese filled sausage coated with a specially formulated batter and deep fried to golden brown. 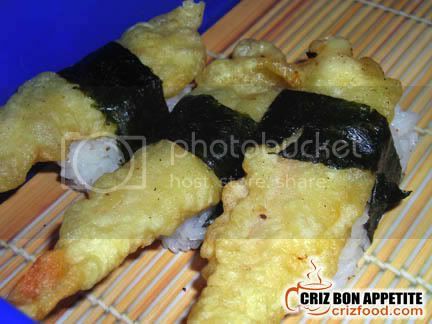 The end product has a sweet tasting crispy crust that tasted a bit sweeter than our local pancake (ban chang kuih) base. The combination of the sweet and salty taste of the product complimented each other well. The best part would be squirting out some existing juice from the sausages as well as some melted cheese oozing out of your mouth. This is such a cool to snack while exploring more bargains in the night markets! As the vans would be on the move each day, I could not provide a specific location map or GPS reading for you to track them down. 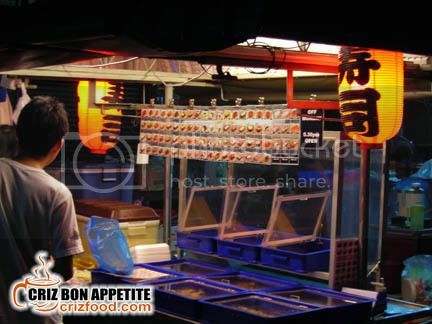 Maybe a detailed venue of the night markets each day (Penang Island and Mainland) would ease you more in your food hunting expedition. Gook Luck! Please check out here for the whereabouts of the mobile vans for each state in Malaysia. Please bear with me this time on the lengthy post as it involved traveling and trying out new food during a totally out of the way island hopping adventure trip. I was off exploring for great food again and this time it was an adventurous trip involving traveling by land and by sea. The destination was Pulau Aman, an island covering an area of 288 acres and is 25 nautical miles from the mainland just off the coast of Seberang Perai’s southern district of Penang, Malaysia. 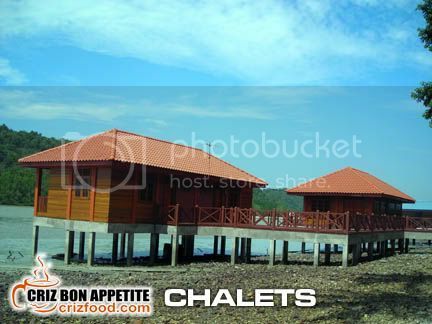 It’s quite a nice island to be on with affordable chalets. You could also book your lodging through KOPEL HomeStay Project or Ministry of Tourism HomeStay Project to stay with the locals and experience their daily lifestyles. There are many activities on Pulau Aman as well as nearby Pulau Gedung such as fishing, snorkeling, camping, hiking, jungle trekking, kayaking, canoeing, historic site visits or just a visit to the bullet warehouse plus the pirates’ cave. It’s truly a back-to-the-nature outdoor experience for those who won’t mind roughing it out in the wild. 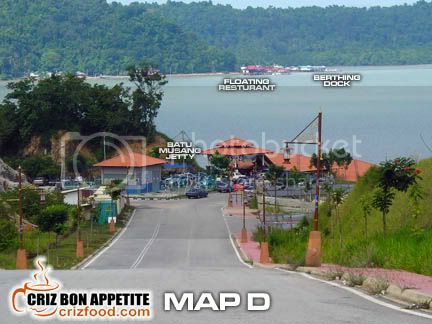 A 10-15 minutes boat ride from the Batu Musang new jetty brought us to Pulau Aman where there existed the famous floating seafood restaurant. The seafood is real fresh as you can see fishermen bringing in all the live catch, which include varieties of shell fish, fish, flower crabs, prawns and mantis prawns. You can even try catching your own and get the restaurant to cook for you at minimal charges. The only disadvantage of patronizing this restaurant is their limitation of food choices. 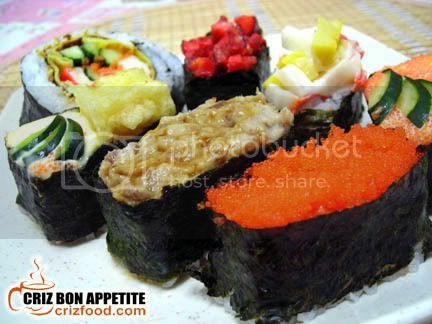 There are only three choices of rice/noodles dishes for you to choose from. 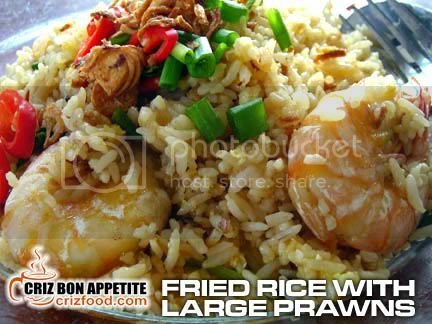 Each plate of rice or noodles would cost differently depending on the sizes of the fresh prawns given. It could be as low as RM5 and as high as RM10. 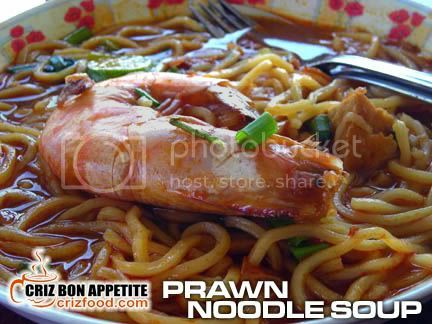 The first dish that arrived was the Prawn Noodle Soup (RM5.50). This was the best prawn noodles I had tasted so far. The soup base was slightly sweet but was rich in flavors with one fresh gigantic prawn, some slices cabbages and fried bean curd. The prawn was almost half the size of the plate of noodles. This is a must to have if you ever visit Pulau Aman. In fact, this dish is one of the most ordered in this restaurant. The next was the Fried Prawn Noodle (RM5.50). 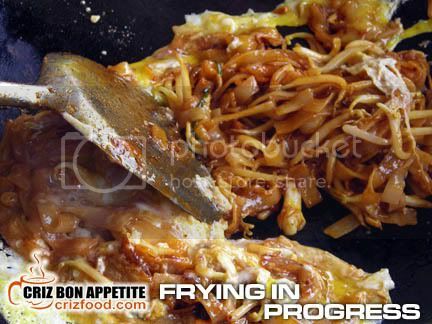 The fried noodles were cooked in a different way compared to the Indian style fried noodles which was slightly drier. 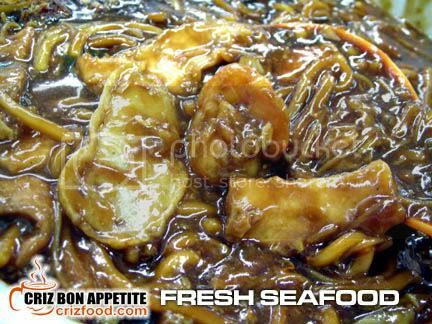 It has 3 medium sized prawns, some cabbages and bean curd slices, garnished with chopped spring onions and chillies. Somehow the Malay lady cook knew the combination of sauces real well. The dish was also superb. Fried Rice with Large Prawns (RM5.50) was served next. 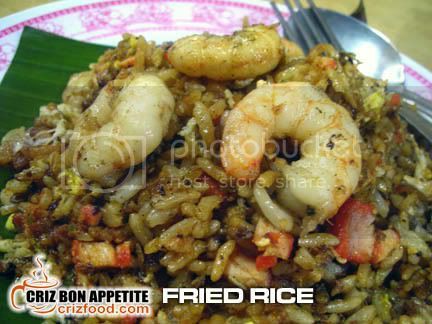 I had frequent so many Malay styled hawker stalls and restaurants but normally found their fried rice to be a bit damp. This Malay lady cook surprised us with one of the best fried rice I had eaten. I could not had imagined how such an elderly lady would be able to provide us with a plate of wok hei (high heat cooking) filled fried rice full of flavors. Accompanied by 3 large and juicy prawns, I almost ordered a second round. Unfortunately, she was out of rice. What? At 1.10pm? She must have a great demand for the day. Since we had almost an hour and a half left before the next boat leaved the island, we went for some sightseeing. It was quite an experience witnessing the lifestyle of the Malay villagers on the island. Although the villagers were living a simple life with basic necessities, they were filled with smiles and contentment. Children were seen playing along the trekking paths and by the semi mud filled beaches but they were seen to be very happy. Even the school and clinic available were such a small scale compared to how fortunate we were to be in the city. One thing which caught my attention was the stray animals on the island. 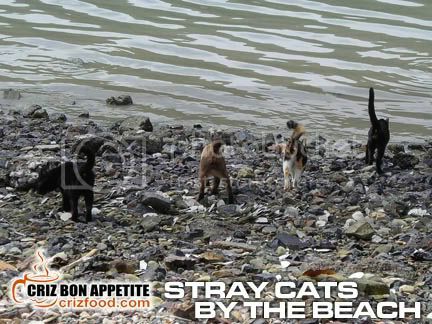 There were barely a handful of dogs but cats could be seen everywhere even by the beaches. Visiting a historic site on this island could be real taxing as every site seemed to be so far apart, although it did look near in the map provided on the sign board on the island. 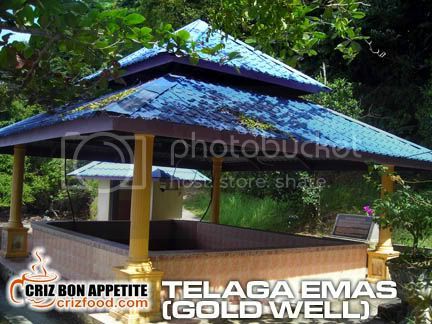 We were traveling almost a quarter of the island before we managed to find the Telaga Emas (Gold Well). History stated that a villager found some “gold” in the well. Eventually, those were discovered to be some colored stones. What amazed most of the visitors was that in it contained fresh, energizing and pure water. Although the well was dug just next to the sea, it did not contain any salt water taste in it. 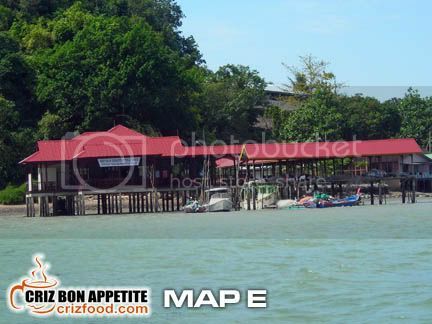 Strolling within the fishing village, we noticed an abundance of a certain 20m trees. 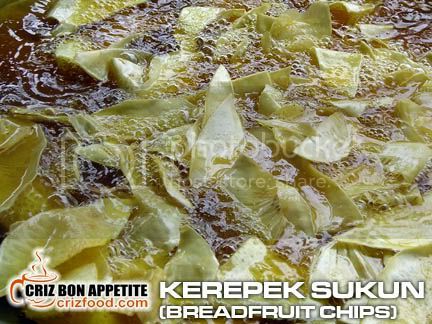 It has leaves almost similar to that of a papaya tree, fruits with texture similar to our cempedak and flesh as white and powdery as tapioca. 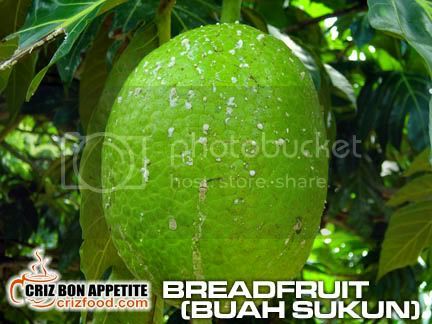 The locals called them Buah Sukun (Breadfruits), a fruit native to the Malay Peninsula and western Pacific islands. We happened to see a stall selling some fried chip-like food by the jetty and thought it was potatoes. As an adventurous foodie, I immediately bought a few packets of the fried chips home, after knowing that they were breadfruit chips. The taste was unique. It was like munching a cross breed of potato and tapioca chips with a hint of jackfruit flavor. After all, a pack was not expensive as it cost me only RM3.50 for a small one and RM5 for a big one. In fact, I bought 3 packets of the smaller ones for only RM10. As you come out from the toll plaza, you would reach a T-junction. Turn right and go over the overhead bridge towards Batu Kawan. Drive a few meters away and you would reach a cross junction. Turn left towards the Batu Kawan Stadium (There will be a signboard showing left towards the stadium. You would pass by the stadium on your left. Drive on until a roundabout. Drive towards your 12 o’clock (leading to Jeti Bandar Cassia) and go straight until you reach a turning on your left (no through road ahead). 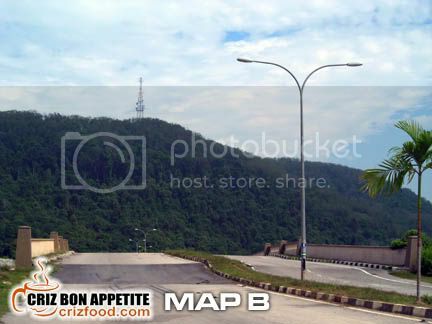 Turn left into the road (a quarry is on your left) and it would lead you to the Batu Musang Jetty. 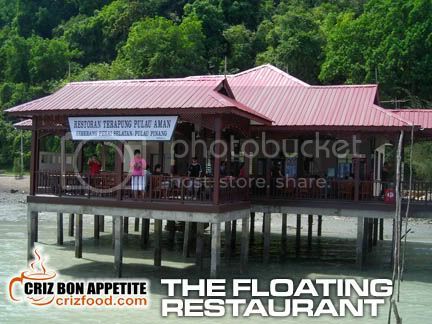 Take a 10-15 minutes boat ride to the floating restaurant. 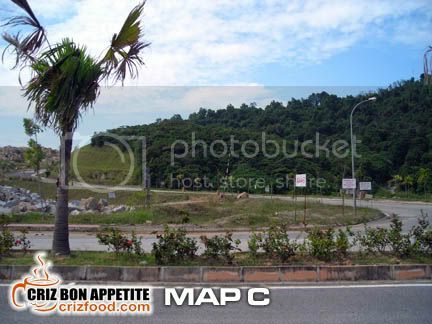 Address: 120 Pulau Aman, 14100 Simpang Ampat, Penang, Malaysia.